March 28, 2008 / Leena S.
Though I cannot relate to this; I do not understand why is everyone so judgemental? Y can people not live according to their own value systems and what they r comfortable and aligned with? who r these people who are fighting battles and arguing about how they feel others should live their life and whether they r being subjugated or liberated?? I love your views and your ability to be so forthright and fearless! God be with you!!! i wish thats how the world was! i dont know why everyone wants to make rules for others. as long as we are not harming anyone, does it really matter wat we are wearing? i dunno how the cartoon carictatures of the Prophet (p.b.u.h) can be freedom of expression for the countries like denmark, while covering one’s own hair cannot be treated as freedom of expression for a muslim woman. its a strange world! What a sad, sad, sad day that shall be. i hope that I dont live to see that day! The way things are going … sometimes I feel that us headcoverers are born in the wrong century. Have you read “Snow” by Orhan Pamuk? P.S. The lady in the picture.. she’s wearing a headscarf .. AND a skirt that shows half her legs? no, i havent read that book. wat is it about? 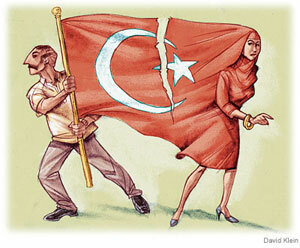 The book is about the suicides of ‘headscarf girls’ in Turkey at the time of its revolution. Your entry reminded me of it. Give it a read. Reminds me a lot of Pakistan sometimes. Or where it’s headed anyway.